The valuation of businesses is since decades a theme, which is still up to date and growing. The reason for the high interest regarding the theme is quite simple: If an enterprise is valued, there is a high amount of money involved. Business values are daily business, at the same time they have a high amount of complexity and issues, the raters are confronted with1. The reason for a business value could be different, starting with management successions and ending with the buy out of an enterprise2. The value of the business can be calculated by different ways. In the last years, the amount of valuation methods increased. Currently there are many valuations available, which end in different results5. But how is the value of an enterprise defined and calculated? Why is the value of a business needed? And what are the differences between the methods? These questions will be answered in the present assignment. The Objective is to show with the help of the concrete example Daimler AG the process of a business valuation including the calculation of the value of the enterprise. 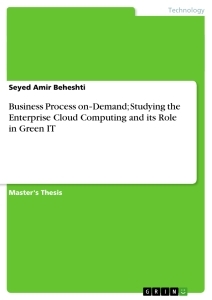 To achieve this objective, the methodology of the present assignment is described in the following chapter first, before the theory of business valuations will be explained. The reasons for a valuation are described and the methods with a focus on Discounted cash flow methods (DCF) and multiples methods are stated. After presenting the company Daimler the methods are applied of Daimler in the fourth chapter, the business value will be calculated with the different methods. The results will be discussed in chapter five, before finally a conclusion and outlook will be given. The methodical basis of the present work is a detailed literature search. This is carried out by the help of relevant specialized literature, professional databases and the Internet. The relevant specialized literature is procured with the help of the library of the University of Dortmund. As professional databases the Springerlin k and wiso were used. The Internet serves with the searching machines Google books and Google scholar as a medium to find information. 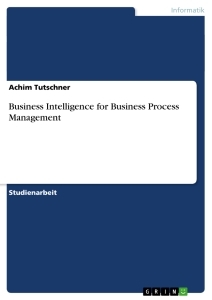 Books in electronic form are covered about the eBook supplier ciando. As key words business value, Discounted cash flow and multiples were used. 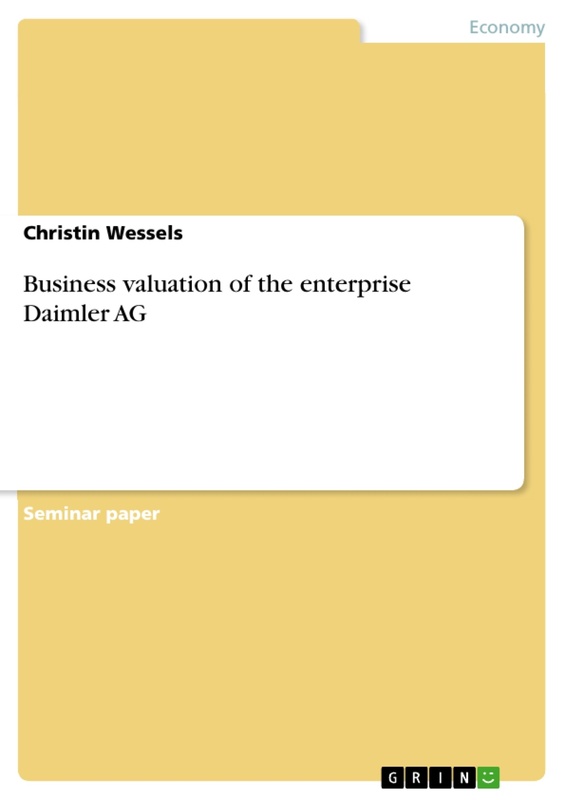 In the following chapter the theoretical background regarding business valuations is described, before the enterprise Daimler is introduced. Business valuations are assessments. Assessments are finished processes, which defines a value for a certain constant, mostly in a form of a monetary value. In case of an enterprise assessment the assessment is a process, where the value of the enterprise is identified6. Enterprises are economic-financial and juridical organisation units, which produce output with the help of factors like work, operating capital and commodities7. The value of the enterprise is the monetary value, the buyer pays or the vendor gets for the enterprise8. Business valuations refer to the future, based on the benefit and consider the risks9. An assessment of a business could be necessary in different cases. Peemöller differentiates between changes in different life cycle phases of an enterprise, different regulations inside and outside the enterprise and changes in the interests of shareholder as shown in Tab. 1. A valuation could be for example necessary, if two enterprises are merged or if a shareholder leaves the enterprise11. The Institute of Public Auditors in Germany (IDW) differentiates between the two reasons for a business valuation: Voluntary and obligatory valuations. Voluntary situations could be reasons like a Management Buy out or sale of an enterprise, obligatory reasons are Purchase price allocations, impairment tests or squeeze outs 12. Voigt et al.13 systematize the reasons for valuating an enterprise by legal background. The first aspect is a change in the distribution of property. Possible occasions are the sale of an enterprise, the Going public of an enterprise, the accession, resignation or compensation of a partner. The second aspect is a modification without a change of the distribution of property. Examples are the verification of the creditworthiness, capital reorganization or the Profit-sharing of employees. The third reason is because of management aspects, ratings and corporate governance. A valuation of an enterprise could be influence the operational and strategical management control, could be needed for the fair value approach regarding earnings reserves in accordance with the IFRS and for ratings. The fourth reason Voigt et al. enumerate, are legal disputes14. The quantity of valuation methodologies increases the last years. For different purposes of valuation different methodologies are needed15. Besides, the scientific knowledge is developing. Up to 1960 the so called objective business valuation was state of the art. The objective business valuation is a valuation methodology, which is detached from subjective opinions or the impact of stakeholders. It reflects the potential of success for everyone, not for a specific group. At the same time this type of valuation focuses on the present and the past. To define the value of a business, the valuation occurs with the help of the intrinsic value method and the capitalised earnings method. These methodologies are not relevant for the present assignment, that’s why they are not described in the following. The reason, why the objective methodologies was the most used method, was, that objectivity was an expression of scientific and verifiable way of working16. The subjective business valuation implemented the individual ideas and visions of the interested parties in the valuation of an enterprise. Since 1960 these valuation methodologies are used more and more. The basic of these methodologies are the idea, that business values depend on subjective perceptions and these perceptions have to be implemented in the valuation of a business. The specific value depends on the interested parties17. Because of the continuing discussion, which approach is the right one, the functional business valuation was developed in the 1970s. The approach contents parts of both prior approaches. The business hasn’t only one value per interested party, but could have different values for the same interested party, depending on the task of the valuation18. The individual valuation methods identify the business value with the help of the price of individual company shares (e.g. stocks) or the summarized components of an enterprise. Depending on the considered components the liquidation value or the asset value is calculated21. The basis for total valuation methods are the cash flows of an enterprise, respecting balance-sheeted and non-balance-sheeted business values. Methodologies using the cash flows of an enterprise are the capitalised earnings value method and the discounted cash flow method (DCF)22. Combined valuation methods identify the business value by combining the individual and total business valuation method23. For the present assignment the total evaluation methods DCF and multiples are relevant, described in the following. DCF methods depend on the future as they are forward-looking methods24. The value of the enterprise is identified by using the cash flows of an enterprise. Cash flows are the net inflows of liquidity during a defined business period25. The idea behind this methods are, that the true value of a business is based on the free cash flows over years plus a terminal value, focusing on cash and not on profits. The DCF methods show, how much cash an investor received for his invested money. It implements the factors risk and future. For the factor future different assumptions relating to the future have to be made26. The DCF methods are divided in methods of gross and net accounting methods shown in Fig. 227. The gross accounting methods are divided in two steps: The first step includes the determination of the market value of the total capital, while the second step includes the determination of the market value of the equity. The equity is calculated with the help of the market value of the borrowed funds subtracted from the market value of the total capital. The basis of the gross accounting methods are the free cash flows. They reflect the earned liquids ressources reflecting net income and changes in current assets, depreciations and provisions29. For the present assignment, the gross accounting method Weighted Average Cost of Capital (WACC) is relevant. The WACC approach is divided in the Free Cash Flow (FCF) and Total Cash Flow (TCF) approach. The first one is described in the following as only relevant for the assignment. The FCF approach is the most time used method of the gross accounting methods. The basis of this approach is to identify the market value of the total capital. This happens with the help of the future cash flows, discounted by the (WACC. The WACC reflects the demand of return of inside and outside creditors. The WACC is needed, because inside and outside creditors have different demands of return30. To get the business value, first the cash flows have to be determined. To calculate the needed cash flows, an accounting for planning and control has to be defined with the constants shown in Tab. 2. 1 See Schacht et al. 2009, p. 5. 2 See Schütte-Biastoch 2011, p. 1. 4 See Verlag für die Deutsche Wirtschaft AG 2012. 5 See Schacht et al. 2009, p. 5. 6 See Matschke et al. 2013, p. 3f. 7 See Schubert 2005, p. 378. 8 See Voigt et al. 2005, p. 14. 9 See Peemöller 2015, p. 25. 11 See Pemöller 2015, p.19. 12 See Pemöller 2015, p. 20. 13 See Voigt et al. 2005, p. 17. 14 See Voigt et al. 2005, p. 18f. 15 See Nölle 2009, p. 18. 16 See Matschke et al. 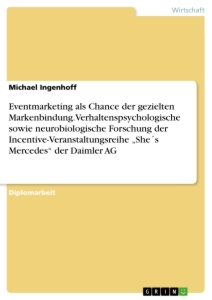 2013, p. 14f. 17 See Matschke et al. 2013, p. 15. 18 See Matschke et al. 2013, p. 15f. 19 See Matschke et al. 2013, p. 123. 20 See Matschke et al. 2013, p. 123. 21 See Matschke et al. 2013, p. 123. 22 See Lattwein 2002, p. 130. 24 See Beatge et al. 2015, p. 359. 25 See Voigt et al. 205, p. 37. 26 See Hayes 2009, p. 86f. 27 See Baetge et al. 2015, p. 359f. 28 See Baetge et al. 2012, p. 360. 29 See Hessischer Rundfunk 2016. 31 See Baetge et al. 2015, p. 373. 32 See Gräfer et al. 2000, p. 673. 33 See Baetge et al. 2015, p. 363.